What a Switch Box does is provide a practical method for interconnecting computers and their peripherals. The user no longer needs to individually change cables or go into costly downtime when switching between modems, printers, or other devices. * This is not an internet or network switch box. * If you need to split up Internet or computer network you want a network switch. More Product InfoThis unit will allow you to switch between up to four different telephone network devices on one jack. 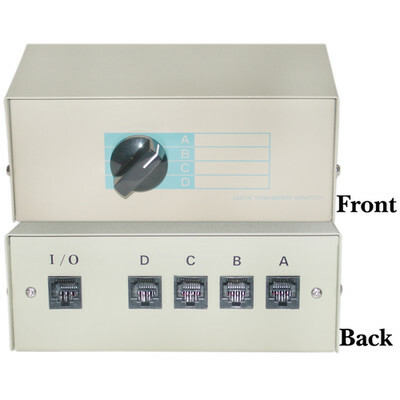 This is a 4 way RJ45 ABCD Switch Box. I use this product to switch (naturally) between console sessions on multiple Cisco devices while I am pre-configuring them. Works Great!